Lowepro has announced a new series of camera cases called Lowepro Quick Case Series. The cases are designed to be streamlined and lets you quickly get your camera. The Lowepro Quick Case Series will come in two sizes, the Quick Case 120 for DSLRs with kit zoom and the Quick Case 100 for bridge, ultrazooms and compact digital cameras. Lowepro today launched into the market a classically styled, fitted case that provides streamlined protection and instant access to today’s best-selling models of bridge and DSLR cameras. The snug-fitting design covers the camera in a durable, impact resistant shell that opens quickly and smoothly, allowing photographers to capture images rapidly. The Quick Case series takes its design inspiration from retro-style, fitted leather cases, but is designed with a modern feel. A hybrid nylon and genuine leather shell provides a tough impact-resistant, stylish exterior that helps safeguard gear from moisture, dust and sand. It’s lined with soft padding to protect the fragile lens and LCD screen from scratches and abrasion. Named for its ability to provide instant access to the camera, the Quick Case features an inventive design with fully integrated construction. A built-in leash tethers to a camera’s carrying strap, securing the case to the camera. 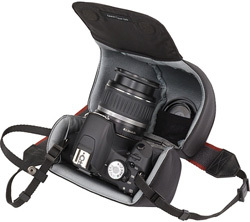 To shoot, a photographer simply pulls open the back flap and raises his or her camera and the case remains suspended below. The Quick Case series includes two sizes; each fits a camera snugly and includes an adjust-to-fit magnetic closure. An accessory pocket is located at the bottom of each case with ample space to store spare memory and batteries and the interior mesh pocket is an ideal place to stash a lens cap when not in use. The Quick Case series is available in two sizes in Black: Quick Case 120 and Quick Case 100. For more information on the series and other products visit http://www.lowepro.com.